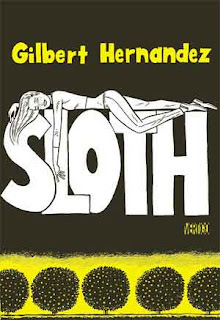 Gilbert Hernandez’s SLOTH is an imaginative graphic novel that examines the feelings of fear, frustration, uncertainty, and joy all adolescents go through during their teenage years. He does this by constructing an imaginative plot line; wherein the two main characters Miguel and Lita, escape the trauma of adolescent love by “willing themselves” into a self-induced coma. When both characters emerge from their coma, they seem to have forgotten about the most stressful moments of their past, and opt to perceive the world in a much slower, methodical way. Hernandez artfully creates illustrations that suggest to the reader that Miguel and Lita are in a dream-like trance while existing in their self-induced comas. His illustrations also suggest the dreamy-like state of a coma is connected to a peace of mind only found with in the lemon grove that much of the plot-line takes place in. The third character, Romeo, also experiences a method of escape from the stresses of teenage angst and love. Romeo succumbs to urban legend folklore and actually transforms himself into a teenage idol with hopes of romance with Lita. When the romance between Romeo and Lita backfires, Romeo escapes inflicting any more trauma upon Lita and Miguel and “wills himself” into a coma as well. Hernandez creatively suggests how young adults opt to escape the social and emotional pressures of growing into adulthood in the 21st century. Within the graphic novel, Hernandez touches on the volatile themes of abandonment, female discrimination in the workforce, love versus lust, teenage idolization, and adolescent self-esteem. Furthermore, Hernandez successfully depicts how the three main characters opt to “fade out” of society through self-induced comas, rather than the much glorified subject of teen suicide. This aspect of the graphic novel makes it a possible candidate for use in the classroom, preferably for twelfth-grade and college-level students. A possible lesson plan for integrating Hernandez’s SLOTH into the classroom includes the exploration of the themes mentioned above. For example, one may choose to create a unit plan on the theme of discrimination in America. Varied texts may include THE INVISIBLE MAN by Ralph Ellison, RACISM 101 by Nikki Giovanni, and SLOTH by Gilbert Hernandez. After a class discussion on the re-occurring theme in all three texts, one may ask students to write a persuasive paper on discrimination in America citing all three texts, or for those students who have a more creative edge; ask students to create their own poem or comic strip incorporating the discrimination theme.